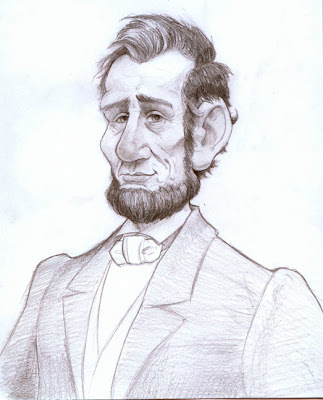 Recently I read part of a biography on Abraham Lincoln and it inspired the sketch below. He was an extremely interesting man with a face that just begs to be drawn. hey, too bad you can’t write a book about a boy who looked kinda like lincoln. That would be really awesome. Fantastic how you’ve added a unioque twist to a face that’s been drawn like a million times. Very distinct and fun, I’d party with this bad boy. you really captured a gentle dignity to him. Hey Mark, you’ve done some really cool work since last we met. I really enjoy this portrait, I can see it as a book cover.